If you are starting from scratch and don’t have any PS3 controllers I recommend using the PS4 controller instead. It’s a better piece of hardware, and pairing is considerably simpler. The most recent XBox One controllers are also an option. This guide therefore is largely for those who have existing controllers and want to make use of them. If you are using a new (5.49 onwards) version of BlueZ with the SixAxis plugin installed you can ignore most of this guide and skip to the ‘pairing with new BlueZ’ section. Most of the information on this page applies only to older bluetooth versions. If you have a newer version of BlueZ and have also compiled or otherwise installed the sixaxis plugin, the pairing process is much simpler. Tested with a custom build of BlueZ 5.49. One of the reasons the SixAxis isn’t as easy as it could be to use is how pairing works. Normal bluetooth devices will establish a link between the device and the host once, then the host can initiate connection using this previously stored information. In the case of the SixAxis, it’s actually the controller that initiates the process, so we have to do some setup beforehand. We need to tell the controller to which bluetooth host it should attempt to connect, and we need to tell the host (the Pi) that it should allow the controller’s connection. This is assuming you’re starting from a clean installation of the Jessie based Raspbian. Other distributions may need varying combinations of dev libraries etc. For testing I was using the minimal installation with filename 2015-11-21-raspbian-jessie-lite.zip but these instructions should apply to any recent version. As always, it’s not a bad idea to run sudo apt-get update and sudo apt-get upgrade to get any changes to packages since your distribution was built. You must now power cycle your Pi. Do not just reboot, actually shut down, pull the power, wait a few seconds and reconnect. This may be overkill, but it’s been the best way I’ve found to consistently have the next steps succeed. You should see a message indicating that the bluetooth master address on the controller has been changed (you can specify the address to which it should change, the default with no arguments is to use the first installed bluetooth adapter, which is what you want unless for some reason you’ve got more than one plugged in). The controller will now attempt to connect to your bluetooth dongle when you press the PS button (don’t do this just yet, it won’t work). The example above shows that no change has been made, as this particular controller had been paired with the dongle before, but you should see two different addresses - the first is the address the controller was trusting, the second is the one it now trusts. Next we need to configure the bluetooth software on the Pi to accept connections from the controller. Type ‘agent on’ and then ‘trust MAC’, replacing MAC with the MAC address you noted in the previous step (they won’t be the same as mine!). Quit the tool once you’re done. If a new device has appeared here then congratulations, you have successfully paired your dongle and SixAxis controller. This will persist across reboots, so from now on you can just connect by pressing the PS button on the controller. Pressing and holding this button will shut the controller down - at the moment there’s no timeout so be sure to turn the controller off when you’re not going to be using it for a while. 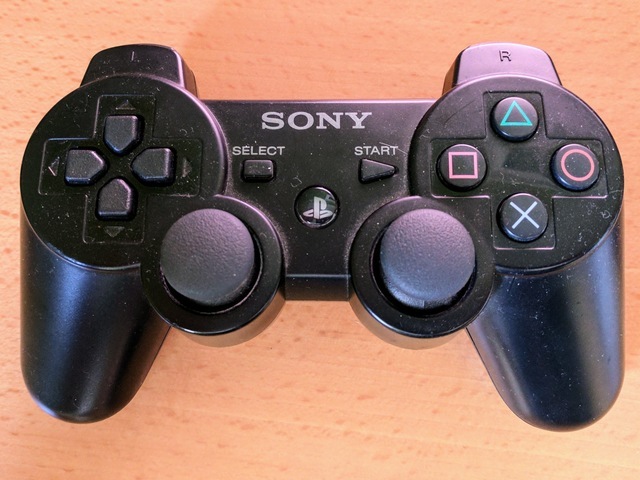 Discover and initialise a PS3 SixAxis controller connected to this computer. dead_zone (float) – Used to set the dead zone for each approxeng.input.CentredAxis in the controller. hot_zone (float) – Used to set the hot zone for each approxeng.input.CentredAxis in the controller. Set front-panel controller LEDs. The DS3 controller has four, labelled, LEDs on the front panel that can be either on or off. © Copyright 2017, Tom Oinn Last updated on Feb 11, 2019.